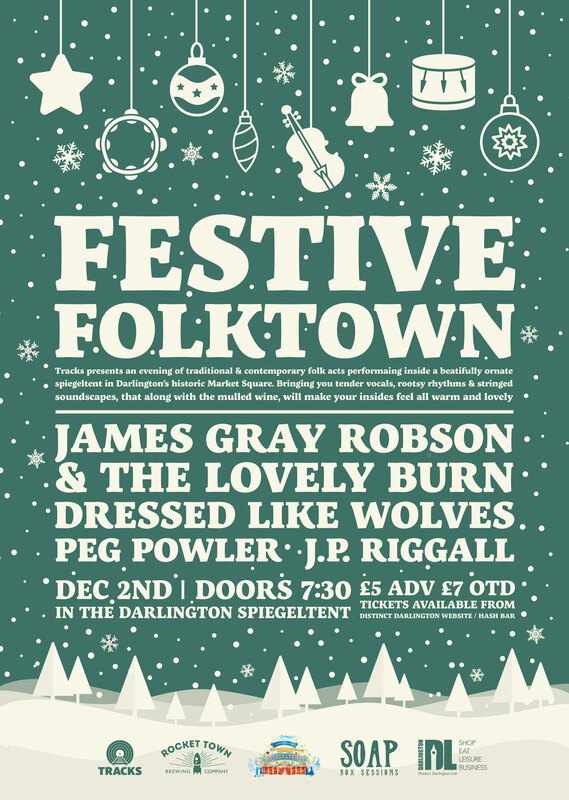 This evening of traditional & contemporary acts is curated by Tracks, in association with Soapbox Sessions, Distinct Darlington & Rocket Town Brewing Co., and will bring you tender vocals, rootsy rhythms and string-filled soundscapes, that along with the mulled wine, will make your insides feel all warm and lovely. James Gray Robson & The Lovely Burn – An alt-Americana inspired duo from the Darlington with soaring, emotive vocals, sparse percussion & warm country blues guitar. Peg Powler are a four-piece traditional folk/acoustic band who perform songs and original material that embraces literary motifs, contemporary life and old-world influence. Dressed Like Wolves – Honest, frantic and heartfelt lo-fi folk music about all the things and people that surround them. J.P. Riggall – Frontman of The Broken Broadcast performing haunting yet soulful chamber folk that will send shivers up your spine.